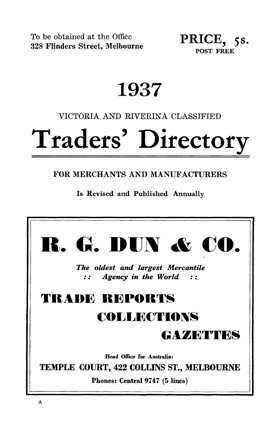 The Traders’ Directory, also in alphabetical order by town, lists the main businesses and their owners in the towns and townships of Victoria. In some cases, the addresses of the main businesses have also been included. It's an invaluable genealogy tool for anyone searching their family history or building a family tree.